As the kanji of the year suggested, 2008 was a year for change. Change, of course, was the message of U.S. President-Elect Barack Obama’s campaign, but in Japan, change seemed to mostly refer to the teledrama CHANGE, starring male idol Kimura Takuya as Asakura Keita — a schoolteacher pressed into political service after his politician father’s death (this is Japan, after all). The naïve and idealistic teacher is propelled to the premiership by the political fixers of the ruling party, who think his popularity can save their flailing organization. Naturally he rises above the murk of the political world and delivers change Japan can believe in. The story could not be less connected to the reality of Japanese politics in 2008. Japan started the year governed by Fukuda Yasuo, who spoke of the need for the ruling Liberal Democratic Party (LDP) to listen to the people. He, however, resigned as prime minister in September, speaking of how he was “different” from the people (which prompted a Japanese internet meme). His replacement Asō Tarō was elected LDP president — and with it, prime minister — by a landslide in the party’s emergency election. Mr. Asō — best known outside Japan for his manga obsession and his all-too-frequent gaffes — was able to convince the party rank-and-file (who rewarded him 134 out of 141 LDP prefectural votes) and the party’s Diet members that he was in touch with the Japanese people and that only he could restore public faith in Japan’s long-time ruling party. This has not quite happened. Far from being in touch with the concerns of the Japanese people, Mr. Asō may be the most insensitive yet. He has been dogged by reports that he frequently spends his evenings drinking in luxury bars. He spoke poorly of doctors and the elderly, important constituencies in a rapidly aging society. These miscues, while crude, will probably not make or break the LDP in the next general election, but Mr. Asō’s inability to respond effectively to the gathering global crisis currently consuming Japan just may. As 2008 ends, Japan finds itself in recession once again, but the LDP has been hesitant in formulating a response. In large part this is because the Asō government is a prisoner of past decisions taken by LDP governments; namely, the government’s hands are tied by a national debt totaling roughly 180 percent of GDP — by far the largest debt/GDP ratio in the OECD. Mr. Asō is also suffering from the mistakes of his immediate predecessors: Abe Shinzo’s disastrous response to missing pensions records contributed to the LDP’s defeat in the 2007 elections for the Japanese Diet’s upper house. And Mr. Fukuda poorly managed the roll-out of a new health care system for citizens over seventy-five. Both have battered the LDP’s support among broad swathes of the public. The opposition Democratic Party of Japan (DPJ), already in control of the upper house, is poised to perform well in the next election, even in regions that have long been LDP strongholds. That being said, the prime minister who has most profoundly impacted today’s LDP is none other than Koizumi Junichiro. Mr. Koizumi’s term as prime minister ended in 2006, but his impact continues to the present. Mr. Koizumi waged open war on the “old” LDP — the party of public works pork, postal patronage, massive koenkai (politicians’ personal support groups), and government-by-factions and zoku giin. He sought to reform the party and the cabinet to strength the position of the prime minister, while changing how Japan spent money on public works in order to undermine what he called the “opposition forces” — i.e., LDP politicians of the old school. The battle over postal privatization tied together all of these threads. But Mr. Koizumi left before he could complete his project to remake the LDP and nation. And in doing so he may have dealt a death blow to the LDP, perhaps as he intended. Mr. Koizumi left an LDP torn into pieces. 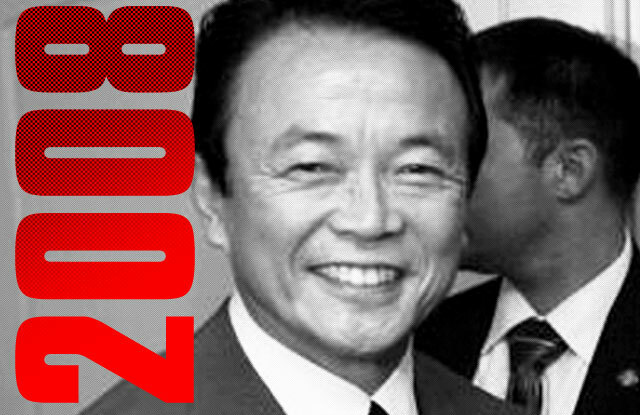 His electoral coattails created a strong reformist bloc within the party: the so-called Koizumi children. At the same time, however, Mr. Koizumi’s departure emboldened the opposition forces, who under Abe, Fukuda, and Asō have worked to reverse or stall further structural reforms and isolate the reformist bloc within the party. Divisions within the LDP is mirrored in the public at large. In urban districts, where Mr. Koizumi enjoyed great success — and where a number of the Koizumi children have their seats — voters are dismayed by the backsliding in the LDP and will likely turn back to the DPJ in the general election required to be held by September 2009. In less populated districts, however, voters are aggrieved over Mr. Koizumi’s reforms, having watched influxes of money from Tokyo dwindle and waited for the government to do something to reverse the precipitous decline of Japan outside Kanto. (Given the demographic makeup of rural Japan, these voters are undoubtedly also alarmed at government mismanagement of the health and pensions systems.) These dynamics contributed to the DPJ’s 2007 victory — Ozawa Ichirō, the DPJ’s president, is a product of the Tanaka Kakuei machine that fortified LDP rule in these areas, and he ably exploited the dissatisfaction of both urban and rural voters. The civil war within the LDP may also finally be coming to a head. As 2008 reaches its denouement, the LDP’s reformists — who have grown ever more discontent at their isolation within the party and fear for their electoral lives if they run under the banner of Mr. Asō — may finally be prepared to break with the LDP. Watanabe Yoshimi, a leading Koizumian and a crusading administrative reform minister under Abe and Fukuda, has openly criticized Mr. Asō’s leadership and suggested that he may try to topple the government and form his own party. Other prominent reformists have criticized Mr. Asō, suggesting that Mr. Watanabe might be able to lead enough reformers out of the party to strip the government of its parliamentary super-majority and trigger a general election. In short, while it appears that Japan experienced no change whatsoever, 2008 has indeed been a year of change. Not merely a change of prime ministers, but a change in the comparative standing of the LDP and the DPJ. Decay could be considered change as well. It is far from clear how the LDP’s current crisis will resolve. 2009 may bring monumental change to the political system: the LDP breaking in half, a new reformist party’s becoming the key to forming a government, the DPJ winning power in a landslide. One way or another, Japan needs political change. The latest economic downturn will only exacerbate the problems already facing Japan. It will make it all the more difficult for the government to provide pensions and other social services. It will delay the government’s efforts to pay down Japan’s national debt to more sustainable levels. It will swell the already swollen ranks of Japan’s temporary workers, who now constitute nearly a third of the labor force. And it will do little to encourage younger Japanese to marry and start families. Contrary to the political philosophy of TV drama CHANGE, changing leaders — or ruling parties — will not make these problems go away. Even Mr. Koizumi, the closest Japan has come to a truly dynamic leader, was forced to compromise in his desire for reform. Change is difficult, and it will not emanate solely from Nagatacho. Voting the LDP out of power, however, could still be an important first step in changing Japan by making its political parties more accountable to the public and stimulating new ideas for how to solve the growing list of problems that darken Japan’s future. Rather than placing blind hope in the “Japanese Obama” — whoever that might be — or a particular party, the Japanese people should strive to build a more responsive, transparent, and accountable democracy. That would truly be change. Tobias Harris is a political commentator on Japanese politics, PhD candidate at MIT, and author of the blog Observing Japan. Tobias, thank you for this amazing review. Everyone’s got their own interests, but for me this has been the most interesting article in this series so far. I am thankful that a writer like you with such an amazing knack for tracking this short-term political skullduggery has turned his attention toward Japan. I imagine that if you had been writing in Roman times your name would live on as one of the great Sources. But I have to wonder if there isn’t some irony in your focus on Nagatacho when your conclusion that change “will not emanate solely from Nagatacho” but maybe kicking the LDP out will be a step in the right direction, seems to place little hope in Diet politics as a source for productive policymaking. What do you make of people like Takenaka Heizo, who worked under Koizumi and concluded that the only way to get things done was to push everyone around? Everything I read from him these days seems to propose working around the politicians as much as possible. Are things as hopelessly broken and corrupt as he seems to think? And I feel I am being too demanding, but what of the influence of the bureaucrats who often guide policy from behind the scenes? Say Ozawa’s DPJ does take power. Will they be agents of change or fight against it? our analysis, written at the end of 2008, is very eloquent and has all the hallmarks of an aspiring political journalist. Commendable turn of phrase and name-dropping that could be considered relevant. 1. The American administration made pretty damn sure that practically the same group of right-wing fanatics who had made Japan a misery in the wartime and pre-wartime period stayed in power. The CIA even employed Yakuza to root out Japanese left wingers. 2. The American administration crushed the Japanese left wing, leaving it with no viable opposition to the ruling party. An utter disaster for the Japanese people, who still have little control over how they are governed or how their lives are determined. Japan STILL provides a nice little airbase in the Pacific from which America can point its weapons at the whole of East Asia, as well as a nice little capitalist barrage against the red elements in Russia and China. One party – right-wing nationalists – in power practically all the time since the war, with no meaningful opposition. 2. A police force tied inextricably to ultra-rightwing groups, and to the Yakuza, which employs extracts confessions under duress, and has an unrealistic 99 per cent conviction rate, where public demonstrations are practically forbidden, and where people who oppose the government get thrown in jail on trumped-up charges. 3. A system in which any politician who speaks out of line gets his house burned down or gets shot. 4. A system where a university professor had death threats for suggesting that the Japan Sea be called something more neutral in negotiations with Korea. A system where ultra-rightist thugs cruise around the streets in sound trucks and beat up anyone who gets in their way, and nobody does anything about it. 5. A system where the press is controlled by an elite club which excludes journalists who criticize the government (anti-police riots in Osaka the other week not reported on the major TV channels. Funny that). 6. A system in which the government deliberately enforces race and gender discrimination, in the face of its commitments to UN treaties on human rights, where the mafia runs one of the biggest people trafficking operations in the world, protected by the police who refuse to release details to international law-enforcement bodies. 7. A system where politicians can stand up and say that ‘human rights’ are an un-Japanese concept and that legislation should be rolled back, and where the government maintains a counterproductive stalemate with Korea and China by allowing extremists undue influence over policy decisions. I could go on, about how the postwar miracle was built on appallingly squalid working and living conditions, about how the big companies are run by an oligarchy that controls and dominates people’s every movement, about how working hours are inhuman and the suicide rate sky-high, how a complete lack of welfare provision leads to destitution (and yet more suicide) but don’t let that bother your little delusion that Japan is a free and democratic country and that some Barack Obama type is going to come along and change things. Also, remember that despite the huge level of debt, Japan is a huge creditor to the US and has one of the highest savings rates in the world, is relatively unaffected by subprime, and when it comes to the crunch can put a lot of people to work in care and nursing homes for the incontinent swarm. What a tool ! what planet do you live on ?! I agree with Edward Nichols. However, in Mr. Harris’s defense, I would like to stress that it is not the duty of the apparatchik to describe the “bigger picture.” That is for the philosophers and poets, who don’t have to worry about things like decorum and tenure.